As the nation prepares to say its’ final goodbye to former President George H.W. Bush, replete with the obligatory on-air twenty-four hour news coverage, tributes by political allies and foes alike, and countless talking heads on television offering their take on the former Commander in Chief, I can only offer an opinion based on a single five minute period of President Bush Forty-One’s life. 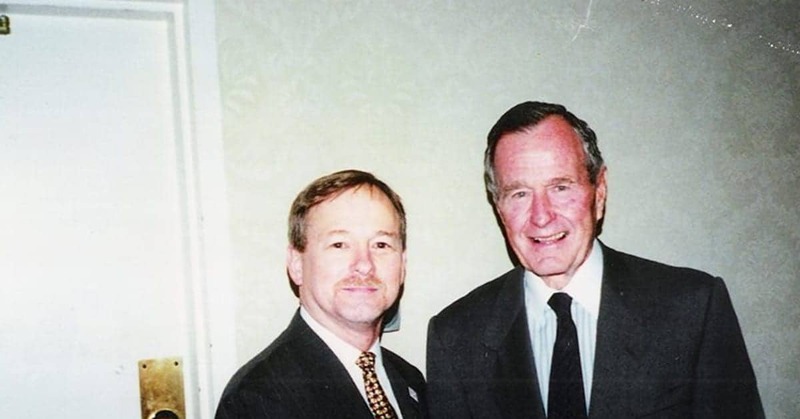 I had the occasion to meet President Bush Forty One a few years after he had left office, when he was making a campaign appearance for a local politician caught up in a tough political battle at the time against a formidable Democrat opponent. At one point I found myself alone in a ‘holding room’ with the former president, as his Secret Service detail and aides left the room to survey the event venue and meet with other officials. I had just been introduced to the president when I entered the room a couple of minutes earlier, and as the aides and protective detail were leaving the room they asked the president if he needed anyone else to stay with him. Without hesitation he responded, “No Del’s here with me, I’ll be fine”. As I mentioned, I had been introduced to him just minutes earlier yet he immediately remembered and used my name. That impressed me to no end. Considering that this man had likely been introduced to countless thousands of people throughout the course of his life, many faceless bureaucrats and minions, it would be understandable that he might not pick up on the name of someone he had met only briefly moments before. And someone who he would soon be separated from and would never see again. It affirmed at least to me that what I had long been told about him by others, and had also read a number of times over the years was true. That he was a genuinely kind and decent person. As we stood there chatting I mentioned to him that we had walked the same corridors once, both of us having worked for the Central Intelligence Agency, though not at the same time. I mentioned that I had gone to work for the Agency shortly after he had left as the Director, but that many of the folks I worked with had been there during his tenure and they all spoke very favorably of him during his time at the CIA. A smile creased his face and President Bush Forty-One responded to me, “Ah, the CIA. I have to tell you that out of all the jobs I ever held that was my favorite one. I loved being CIA Director”. Of course he asked me about my work, where I had been overseas, and if I enjoyed my time with the Agency. I answered his questions and was struck by the fact that he looked directly at me as I was talking, and he seemed genuinely interested in what I had to say. He didn’t at all appear that he was just being polite. Finally his aides showed up and began to usher him out of the room. He hesitated and then told his aide, “Let me get a photograph here with Del”. I was stunned, and thrilled at the same time. I had hoped that I’d get the opportunity to have a photo with him, but was hesitant to ask for one myself. He took my hand in his and shook hands with me as we posed for the photograph. He then thanked me for staying with him, and then he left the room with his aides and protective detail. The fact that this former leader of the free word called me by name, and did it so naturally as though we had been life-long friends, to this day still chokes me up when I think about it. The fact that I shared a conversation, no matter how brief that it was, with a person of such monumental historical significance still amazes me to this day. I can remember vividly every single detail. A memory that will stay with me forever. No doubt about it at least from my experience, former President George H.W. 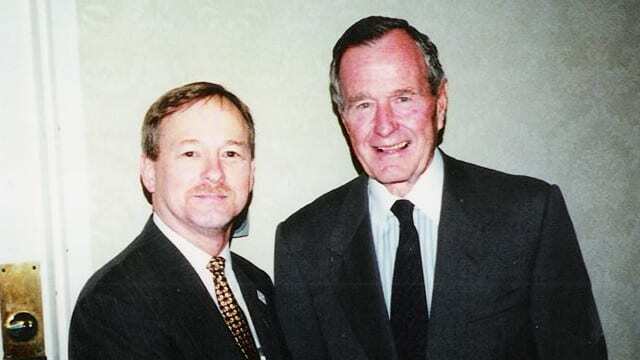 Bush was a genuinely kind and decent man. He really did care about people. And America is just a little bit poorer today as a result of his passing. Del is a former under cover employee of the Central Intelligence Agency serving overseas in Eastern and Western Europe, and the Middle East. He currently does consulting work in counterterrorism and writes columns, as well as appears as a guest on a number of programs.